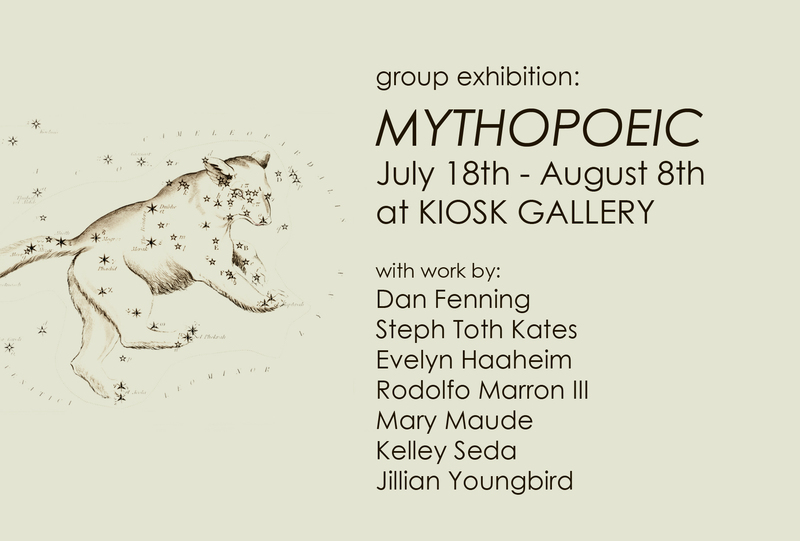 This group exhibition features the work of Dan Fenning, Steph Toth Kates, Evelyn Haaheim, Rodolfo Marron III, Mary Maude, Kelley Seda, and Jillian Youngbird. The work in this show explores a range of both traditional and newly imagined mythologies – revealing personal and sacred narratives. Dan Fenning creates digital photo collages that blend images to overlap stories and memories. In his piece “TRY AND REMEMBER”, he memorializes a friend who has passed in order to keep his story alive. Rodolfo Marron III samples elements from the stories of many different religious and cultural groups, and he often uses methods of creating paints and dyes using pigments derived from traditional, natural sources. In his painting “What Is To Give Light Must Endure Burning”, he incorporates pigments he made from elderberries, tying together the medium with the story he tells. In the grouping of work by Fenning and Marron, in addition to Kelley Seda’s painted urn titled “ashes”, the viewer may contemplate how the passing and remembrance of loved ones becomes family history, then legend. The formation of the earth and how its creatures came to live there is a favorite mythic theme. Jillian Youngbird’s work pulls from her Cherokee heritage, but she considers contemporary concerns. In her drawing “Jitsu”, she gathers imagery from a traditional story about the formation of the forest, containing the silhouetted trees in clean lines and pattern inside the rabbit’s body. Mary Maude’s sculpture “Roughneck (born to be a roughneck)” is full of action – a warthog is formed from swirling mud, bringing to mind animal origin stories, as well as referring to the act of sculpting from clay itself. The viewer may be familiar with some of the classic stories represented. Steph Toth Kates finds inspiration in fairy tales, and her painting focuses on a turning point in the story of The Huntsman. Here the fox stands in for the wolf, and the mouse represents Little Red Riding Hood and her Grandmother, as they are trapped in the belly of the wolf before being freed by the Huntsman. Kelley Seda’s painted skate decks both illustrate Aesop’s fables, which always have a moral – the cat bride who could not escape her true nature, and the one-eyed doe who could not escape her fate. Evelyn Haaheim has spent the last decade painting, and meditating on, images of Mount Kailas in the Himalayas. Haaheim feels a great connection to this place, which is sacred to Hindus, Buddhists, Jains, and followers of the Bon religion; she sits on the floor of her studio studying photographs of Mt. Kailas and paints its likeness from various angles. All of the artists in this show are using myths and stories in their own ways – bringing them to life with different symbols, and rearranging the elements to make them their own. Today’s stories can eventually become legends, and the artists represented here are relating what they’ve learned and experienced in their own visual languages.